Spread some chocolate happiness with one of our elegantly packaged gift collections, or stock your cupboard with our bulk selections. Become a retail partner and sell truffle Cubze in your shop. Unique selections for weddings, showers, corporate events, referral gifts and more. Our unique extra large cubed truffles are made with high-quality ingredients and are available in a delicious variety of flavors including cappuccino, chocolate, cookies & cream, cranberry, mint, peanut butter, raspberry and sea salt, coated in either milk or dark chocolate. People can enjoy a single piece or share the happiness by giving Cubze as a gift. Innovation or Imitation? GODIVA Copied Our Truffle Cubze Concept And Claimed It As Their Own. We introduced our unique cubed truffles eight years ago in 2011. In September of 2018, GODIVA announced the introduction of what they deemed a new innovative concept: a Cube Truffle. GODIVA has appropriated our novel concept of a cubed truffle. GODIVA has even used a name that very closely resembles our trademarked Cubze name. Using its substantial marketing and financial resources, GODIVA can easily overwhelm The Happy Chocolatier original cubed truffle, Cubze. 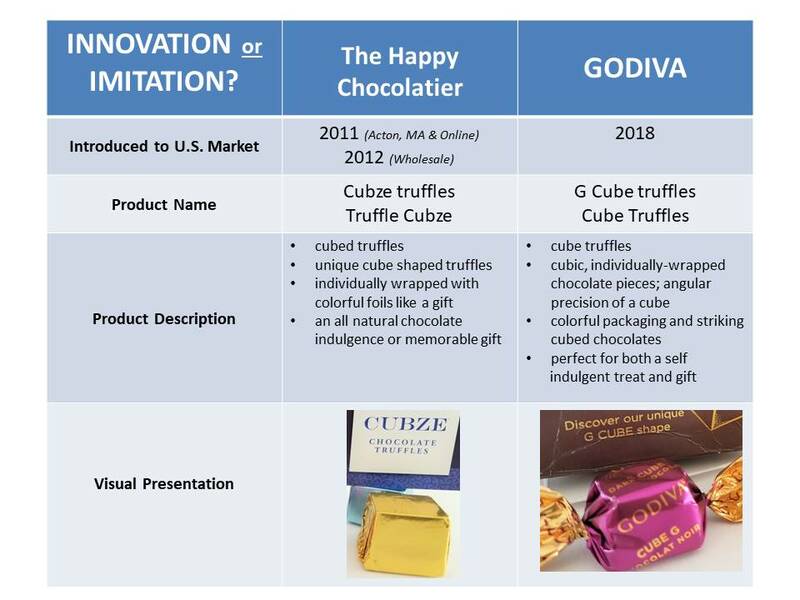 If our truffle … Continue reading Innovation or Imitation? GODIVA Copied Our Truffle Cubze Concept And Claimed It As Their Own. TRUFFLE CUBZE FOR EASTER…a new holiday tradition: Bring a gift box to your host for the holiday. Ship a gift box to someone you love to celebrate Easter. Use our colorful, happiness filled truffle Cubze as table favors, or an addition to your dessert table. Include a few truffle Cubze in Easter baskets. 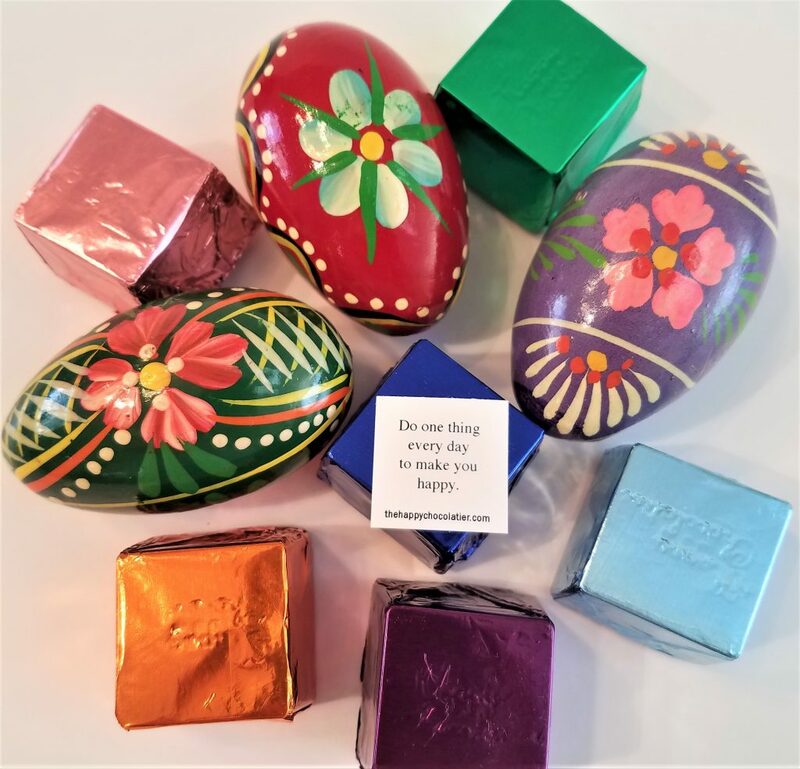 The Easter Bunny loves our witty happiness thoughts wrapped inside each piece.